A place to store my documentaion of day to day IT Projects. Hopefully it will be a useful resource for others too. To use the advanced features of Samba, it has to be compiled with ACL support (e. g. RHEL requires the libacl-devel to be installed, when compiling). Also you need a filesystem that supports the "user" and "system" xattr namespaces. It also needs to have ACL and XATTR support. Please be careful modifying your fstab. It can lead to an unbootable system! 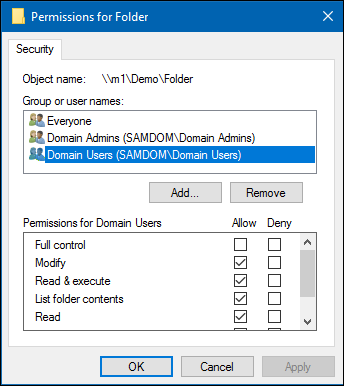 The following is only required on Domain Member Servers and not on Domain Controllers! These options are required on Member Servers, to enable the possibility for real windows ACL's. 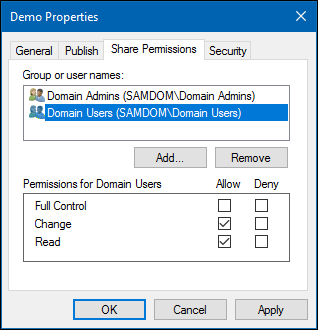 Domain Controllers have ACL support enabled globally by default! 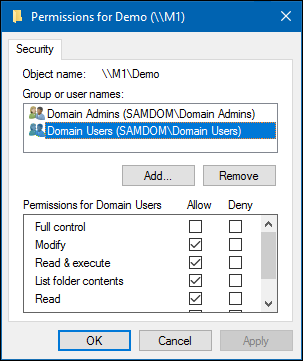 Log on to a Windows machine, using an account to which the „SeDiskOperatorPrivilege“ was granted, or an account in a group with the granted privilege. Open the Start Menu and search for „Computer Management“. In the menu bar go to „Action“ / „Connect to another computer“. Enter the name of the Samba server you have create the new share on. Navigate to „System Tools“ / „Shared Folders“ / „Shares“ and select the newly added share. Right-click to the share name, choose „Properties“ . Go to the „Share Permissions“ tab. Here you can configure who can access the share and the appropriate permissions. Go to the „Security“ tab, click the „Edit“ button and configure the filesystem permissions. Save the changes by closing the windows with „OK“. Log on to a Windows machine as Domain Administrator. Navigate to the folder of which you want to change the permissions. Right-click to the folder and choose „Properties“. Go to the „Security“ tab and click the „Edit“ button. Change the permissions to your needs.